On the 6th (Wed), hike the day away at Bright Angel Trail. There's still lots to do: explore the stunning scenery at Grand Canyon South Rim, get great views at Hopi Point, take a memorable drive along East Rim Drive, and tour the pleasant surroundings at South Kaibab Trail. To see reviews, photos, and more tourist information, read our Grand Canyon National Park trip tool . New York City to Grand Canyon National Park is an approximately 12.5-hour combination of bus and flight. You can also do a combination of flight and bus; or drive. You'll gain 2 hours traveling from New York City to Grand Canyon National Park due to the time zone difference. While traveling from New York City, expect somewhat warmer days and little chillier nights in Grand Canyon National Park, ranging from highs of 57°F to lows of 23°F. Wrap up your sightseeing on the 8th (Fri) early enough to travel to Las Vegas. Take a break from Las Vegas with a short trip to Hoover Dam in Boulder City, about 50 minutes away. There's lots more to do: make a trip to Bellagio Fountains, explore the stunning scenery at Red Rock Canyon National Conservation Area, see the interesting displays at The Neon Museum, and browse the different shops at The Grand Canal Shoppes at The Venetian. To see traveler tips, reviews, more things to do, and tourist information, go to the Las Vegas online trip planner . Do a combination of flight and car from Grand Canyon National Park to Las Vegas in 4.5 hours. Alternatively, you can drive; or take a shuttle. You'll gain 1 hour traveling from Grand Canyon National Park to Las Vegas due to the time zone difference. While traveling from Grand Canyon National Park, expect somewhat warmer days and much hotter nights in Las Vegas, ranging from highs of 74°F to lows of 52°F. Cap off your sightseeing on the 12th (Tue) early enough to travel to San Francisco. San Francisco is known for nature, museums, nightlife, shopping, and childrens museums. Your plan includes some of its best attractions: take in the views from Golden Gate Bridge, admire the natural beauty at Japanese Tea Garden, take in the waterfront at Fisherman's Wharf, and get curious at California Academy of Sciences. To find traveler tips, photos, maps, and other tourist information, you can read our San Francisco day trip tool . Traveling by flight from Las Vegas to San Francisco takes 4 hours. Alternatively, you can drive. Traveling from Las Vegas in March, expect nights in San Francisco to be about the same, around 50°F, while days are slightly colder, around 65°F. Wrap up your sightseeing on the 16th (Sat) early enough to travel to Washington DC. Washington DC is known for museums, historic sites, nightlife, zoos & aquariums, and parks. 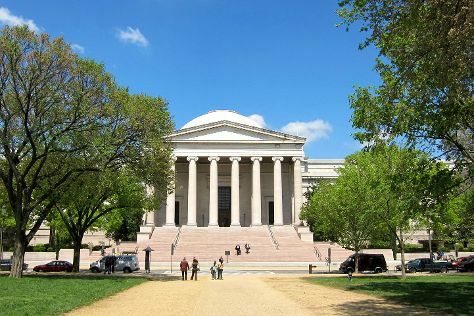 Your plan includes some of its best attractions: admire the masterpieces at National Gallery of Art, see the interesting displays at National Air and Space Museum, admire the landmark architecture of Washington National Cathedral, and take an in-depth tour of United States Holocaust Memorial Museum. For reviews, maps, where to stay, and tourist information, refer to the Washington DC holiday maker tool . Fly from San Francisco to Washington DC in 7 hours. Alternatively, you can do a combination of flight, bus, and subway; or drive. You'll lose 3 hours traveling from San Francisco to Washington DC due to the time zone difference. Traveling from San Francisco in March, things will get little chillier in Washington DC: highs are around 55°F and lows about 37°F. Finish your sightseeing early on the 19th (Tue) so you can travel to New York City. New York City is known for museums, nightlife, shopping, historic sites, and parks. Your plan includes some of its best attractions: go for a walk through Central Park, don't miss a visit to Empire State Building, admire all the interesting features of The High Line, and appreciate the history behind 9/11 Memorial. For maps, more things to do, photos, and more tourist information, refer to the New York City trip planner . Getting from Washington DC to New York City by flight takes about 3.5 hours. Other options: take a train; or drive. When traveling from Washington DC in March, plan for slightly colder days and about the same nights in New York City: temperatures range from 49°F by day to 35°F at night. Finish your sightseeing early on the 24th (Sun) so you can travel back home.